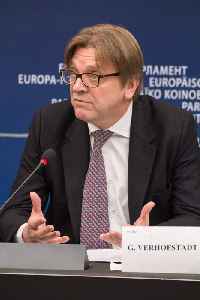 Guy Maurice Marie Louise Verhofstadt is a Belgian politician who has served as the Leader of the Alliance of Liberals and Democrats for Europe and a Member of the European Parliament (MEP) from Belgium since 2009. He served as the 47th Prime Minister of Belgium from 1999 to 2008, Deputy Prime Minister of Belgium from 1985 to 1992 and Minister of Budget from 1985 to 1992. He was a Member of the Chamber of Representatives from 1985 to 2009.